The Williamstown Farmers Market! 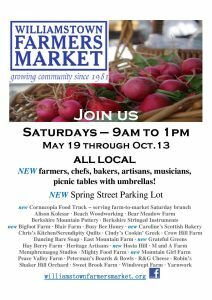 Co-sponsored by the Williams College Zilkha Center and the CES, the market will be at the Spring Street parking lot - expanded and improved over the past winter. All local offerings - find farmers,bakers, chefs, artisans, and musicians.